Recruting your next talent or simply searching for jobs? MyJobMag is positioned to help you achieve your goal. As a recruitment company, we offer series of services that helps business owners and HR find the best talent to suit their job vacancies. 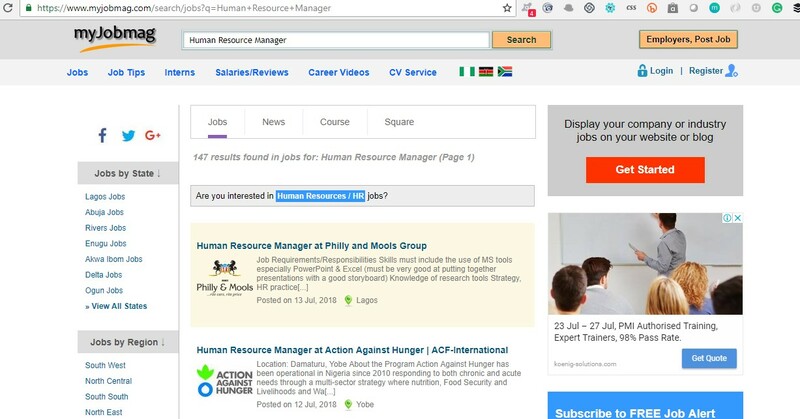 Also our job site is useful for job seekers who are looking for the current and lastest job vacancies to apply for in Nigeria. Searching for a particular job position, company, related job, news and courses shouldn't be hectic and we've made sure you're able to search for any job position with ease. 3. The pages returns a search result, displaying the list of jobs available, news and square related to the job title searched for. 4. The image below shows the list of news related to the job title/position searched for; Human Resource Manager. Our job at MyJobMag is to make job search extremely easy for job seekers. With our search tool on our website, users can easily search for any job title/position and also find related news to the position searched for.